The perfect muffin recipe to add your favorite extras too. Great with strawberries, blueberries: raspberries, dried cranberries, chopped strawberries, grated apples, chocolate chips, raisins, nuts, cinnamon sugar, etc. Nothing fancy here, folks, just some good simple muffins with strawberries. I’ve posted this recipe before but it was quite a while ago and so I figured quite a few of you might not have read it. It comes from the Houston Chronicle Flavor section and is so quick to make that I woke up that morning, read the paper while drinking my first cup of coffee and then had the muffins made before anyone else came down for breakfast. If you measure and mix efficiently, you can have these in and out of the oven in 30 minutes. After the first cup of coffee, of course. Without coffee, I am thinking 45 minutes tops. Our #MuffinMonday host, Anuradha, prescribed the strawberries. The recipe was up to us! Alternative additions in place of the strawberries: raspberries, dried cranberries, chopped blueberries, grated apples, chocolate chips, raisins, nuts, cinnamon sugar, etc. Preheat oven to 400°F or 200°C. Generously grease cups and top of 12-cup muffin tin or line with paper cups. Hull and chop your strawberries. I also give them a good rinse before cutting and then dry them in a towel. In another bowl, whisk together milk, canola oil, vanilla and eggs. Add all the milk mixture to flour mixture, then gently fold just until dry ingredients are moistened. Then fold in your strawberries or your alternate ingredients. The cups are going to be pretty full. Remove from oven and let cool 10-15 before removing muffins from tin. Once they are cool, you can sprinkle on some powdered sugar if desired. This recipe can also be baked as a cake, if you don’t have a muffin tin. Extend baking time by five to 10 minutes or, once again, until golden. I have been meaning to make strawberry muffins. Strawberries are in season, so super cheap here right now. Maybe I will get to making these today! Hugs to you, Lyn! Glad you are feeling a bit better. Here's to complete recovery! Looks yummy! Will definitely try these. So easy, Debbie! You can do it! This looks like a hand-held strawberry shortcake! I could eat about 3 right now! It is kind of like that, Kelli! Found you on pinterest - so excited to try these... they're in the oven right now and were super easy to whip up! And I'm definitely not a baker. You've made my day, Erin! Hope you enjoy them! Muffins are so easy, aren't they? 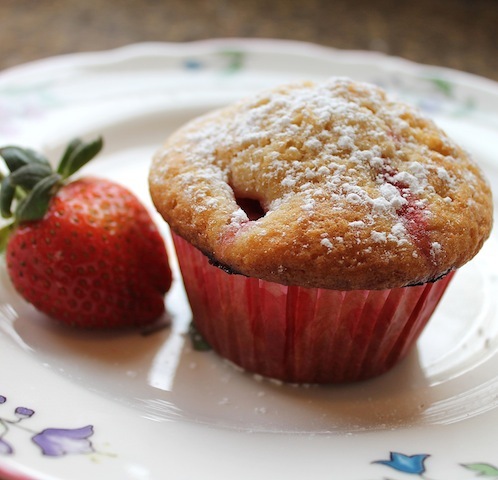 I've never put strawberries in muffins before - these look so good! Thanks for letting me link to your recipe on my blog!